Tell your friends and family that Champlain Maker Faire is sold out. They will be selling tickets at the door (either the Shelburne Farms gate, or the Coach Barn entrance) as visitors leave the event, so you should show up after noon if you want to get in! Author Jesse KrembsPosted on September 28, 2012 October 3, 2014 Categories event, Maker FaireLeave a comment on CMF Sold Out! That’s right kids there are two Maker Faires this weekend..but only one will have Lab B! 2 Maker Faires to Choose From This Weekend in the Northeast | GeekDad | Wired.com. Champlain Valley Maker Faire is coming! Laboratory B will have a booth at the Champlain Valley Maker Faire, the Faire is Saturday September 29th from 10-7 at the Coach Barn at Shelburne Farms. At the booth we’ll teach young and old how to solder! We’ll have some awesome kits from SparkFun. You should buy tickets now to make sure you can get into the Faire. 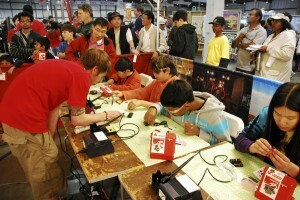 Do you think having a Maker Faire in Vermont is cool! If so print out some posters and join the street team! Let people know! Author Jesse KrembsPosted on September 18, 2012 October 3, 2014 Categories awesome, event, hackerspaces, Maker Faire, Projects, robots, scienceLeave a comment on Champlain Valley Maker Faire is coming! 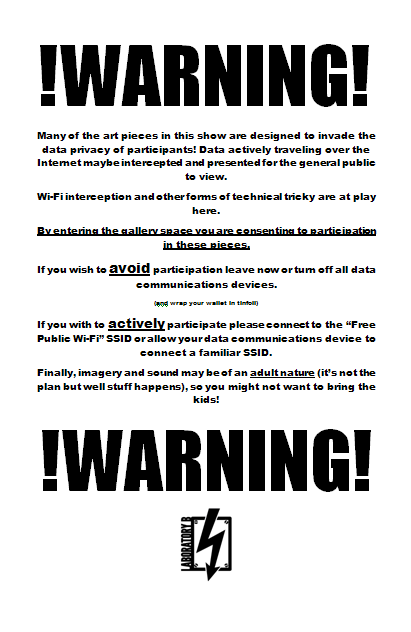 Come by Lab B for a transgressive art show involving, light, sound, your data and the Internet! It’s going to be fun! It’s so awesome it has a warning label. We’re going to be open on Friday and Saturday. Friday from 5-10 and Saturday 10-5/Whatever. There will be throwies, Free Internet Access, and data fun! This is also the First Friday of the Month..so 2600 up on Main St might be a little sparse..come see the Art Show instead!